Dr. Breanne Niebuhr provides comprehensive family eye care and specializes in the management of ocular diseases and low vision. She provides care for patients of all ages—including children—and often treats eye infections and trauma in addition to prescribing contact lenses and glasses. A board certified optometrist, Dr. Niebuhr received her optometric degree from the Illinois College of Optometry, where she was a member of the Gold Key National Honor Society, and completed her residency at the Kansas City Veteran Affairs Hospital in 2007. She earned her undergraduate degree from Kansas State University. Dr. Niebuhr is a Fellow of the American Academy of Optometry and a member of the American Optometric Association, Kansas Optometric Association, and the Greater Optometric Society of Kansas City. 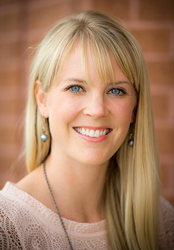 Dr. Niebuhr and her husband are the proud parents of three busy boys and a sweet baby girl. Besides spending time with her family, she enjoys running, gardening, and cheering on the K-State Wildcats!